Tara Kay Myers inflatable swan raft scare: Drifts off Anna Maria Island. Pictured, Tara Kay Myers and her 7 year old son on their inflatable swan raft. Image via social media. 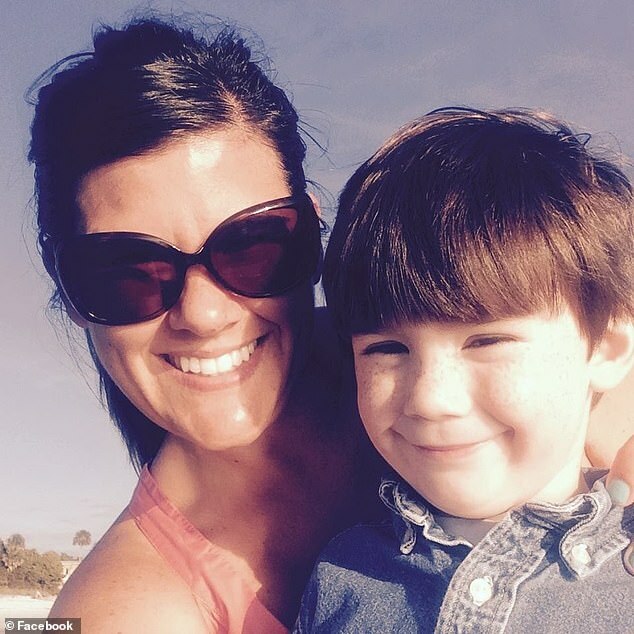 Florida mother, Tara Kay Myers and her seven year old son fear for their lives after drifting off in their inflatable swan raft off Anna Maria Island. So much for late summer adventures. 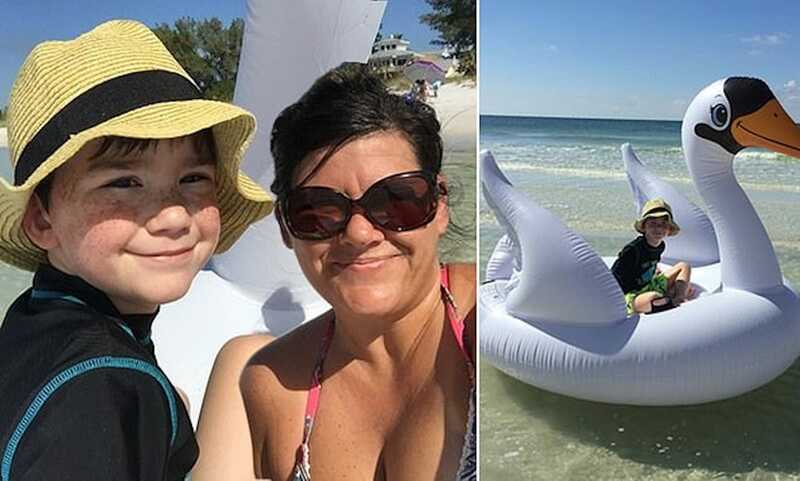 A Florida mother has told of a (mis)adventure involving herself and her 7 year old son which left the pair moribund after drifting off several miles in their inflatable ‘swan’ raft. Tara Kay Myers and her son were lounging on their brand new inflatable off Florida’s Anna Maria Island– when what was supposed to be a ‘fun’ day at the beach-side a few weeks ago turned into several hours of angst. At some point, Myers and her 7 year old son found themselves having drifted off into the ocean. According to the mom, there was no wind and no waves. It had seemed after-all the perfect conditions to bring out the family’s new beach toy. But it wasn’t. Inexplicably, within minutes, Tara and her son realized they were several miles off shore. ‘I was not sure if we were going to keep drifting because land just kept getting farther and farther and farther away,’ the mother told WFLA. Tara tried to swim against the current, paddling hard and kicking her feet to try and get the swan to move forward. But it wasn’t enough. That’s when Tara recalled ‘really’ starting to panic, wondering if she and her son would survive. As Tara tried to remain calm in front of her son and come up with a plan, fellow beachgoers had thankfully seen them drifting away and called 911. Despair turned to elation when Tara saw West Manatee Fire Rescue boat approaching them. The minute they got to shore, Tara made sure the swan could never be used again. Her son took his shark tooth necklace and used it to puncture a hole in the raft. Tara was flooded with relief when she saw the swan deflate. A firefighter then threw it into a dumpster. Now Tara is speaking out to warn families of the dangers of using these types of rafts in the ocean. Pictured, Tara Kay Myers and her 7 year old son. 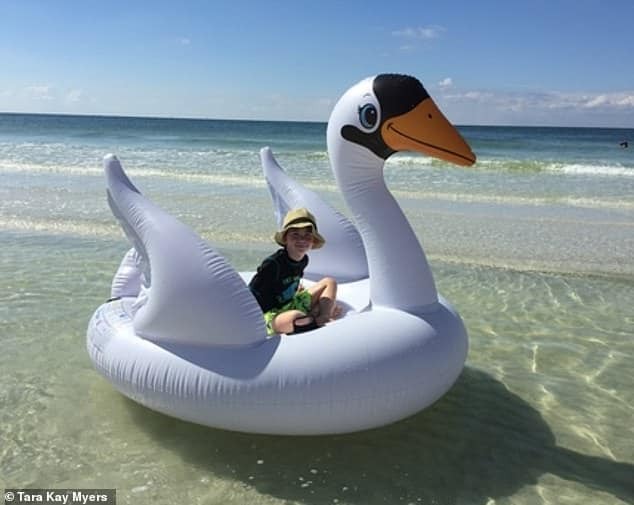 Pictured, Pictured, Tara Kay Myers’s 7 year old son and the family’s inflatable swan raft.